In past years, January, February, and March have been wide-open for fishing in the warm water discharges of the Patapsco and Potomac Rivers and around the power plants of the Mid-Bay. In February 2014, my fishing partners and I enjoyed the best day I’ve ever heard of, going forty over forty. Yes, that’s forty huge stripers over forty-inches long, all caught in one morning. The fishing was so good we were trying to glue two ten-inch Bass Kandy Delights together so we could pull out the biggest of the big fish. In years like that, you can make a lot of mistakes and still catch fish. While I’ve seen some good days since then, nothing like that happened this year. To catch big fish this winter, we had to pull out all the stops. Things are picking up this week, but up to now, a typical day has been one or two big fish per trip (if we’re lucky) mixed in with some much smaller ones. What we aren’t seeing is the thirty-inch class fish. With few exceptions, the fish we’ve been catching are either over-forty-inch cows, or sub-twenty-inch dinks – emphasis on the dinks! I have a theory as to why. (Okay, you can call it an excuse.) Water temperatures in the main stem of the Chesapeake have been warmer than usual this year. The Bay never came close to freezing like it did in February of 2015. As a result, I think a lot of big fish bypassed the comfort of the warm water discharges and just moved on up into the rivers. I can support my theory by pointing to all the fish that are being caught in the Patapsco. The warm water discharges near Baltimore Harbor have fished way better than in past years. I’m also hearing reports of breaking rockfish both above and below the Bay Bridge and in rivers on both sides of the Bay. 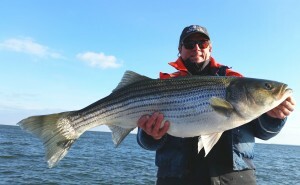 Fishermen with cabin fever don’t have to look very hard to find fish close to home this spring. I don’t like to talk very much about winter fishing during the coldest months. This winter, many of the hard-core regulars who fish the warm-water discharges decided to keep photos and reports to a minimum. There are several reasons. 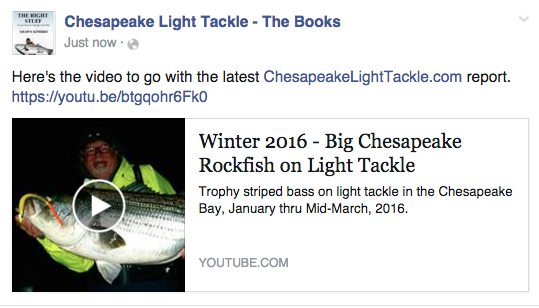 An important one is that the Chesapeake Bay is a dangerous place in Winter. The warm water discharges can release very strong currents causing waves to pile up against the wind. I’ve seen six-foot-high standing waves in places. If your boat gets sucked into a rip like that, it might not come out. When someone over-hypes a fishing spot, it brings out less-experienced anglers who are more prone to accidents. Boats sink, kayaks turn over, and people can die. I make occasional forays into the Patapsco in the winter, but I typically fish around the Bay Bridge or at Calvert Cliffs Nuclear Power Plant. Even though both locations have been tough, that hasn’t stopped us from trying, or from catching some nice stripers. This week, the migration is in full swing. Since some of the local guides (well, you know, one) are finally starting to catch a few and post all over the Internet, I thought I’d better set the record straight. So, breaking radio silence, yes, since January, we’ve been catching some big fish. Some have been over 50 pounds. Yes, we’ve been fishing in tough weather conditions and our best days are always the worst weather-wise. Yes, it’s required stealth and finesse to catch the bigger fish. (Obviously, the guys who insist on drifting down the middle and vertical jigging haven’t been catching much.) 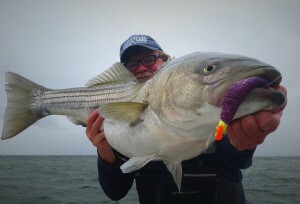 And, yes, the bite is usually over very quickly and never develops when there are a lot of boats around. 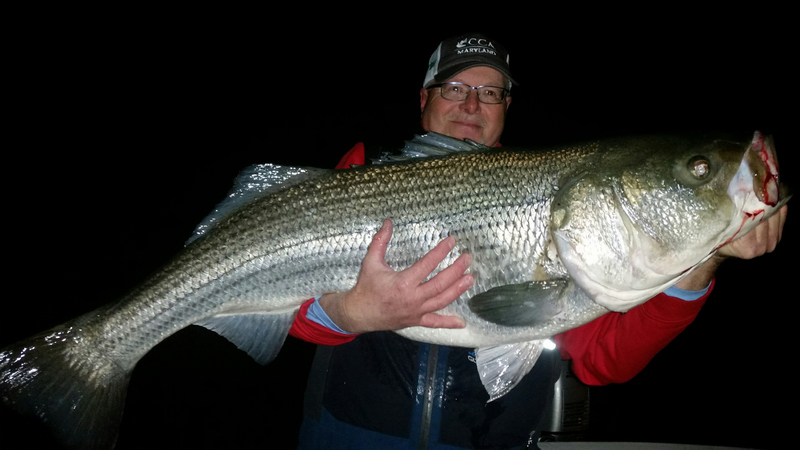 Ron McMorrow and his crew have caught more big fish than anyone in the Chesapeake Bay this winter. These young anglers are giving it all they’ve got, even sleeping in their cars on some nights so they can fish both late evening and early morning. In chapter 11 of my book, The Right Stuff, Gear and Attitudes for Trophy Light Tackle Fishing, I wrote about the importance of dedication. I pointed out that, while there is always an element of luck in fishing, the anglers who work the hardest will consistently catch the biggest fish. These guys took that concept and the techniques in my strike triggers strategy to heart. 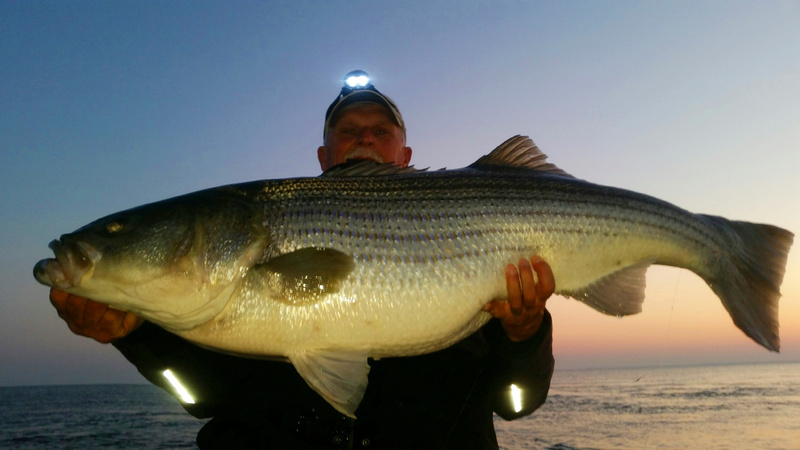 Ron, Alex, Craig, Joey, and the rest of the gang have caught and released at least a half-dozen fifty-pound rockfish, and they’ve seen many more that are over forty-inches long. 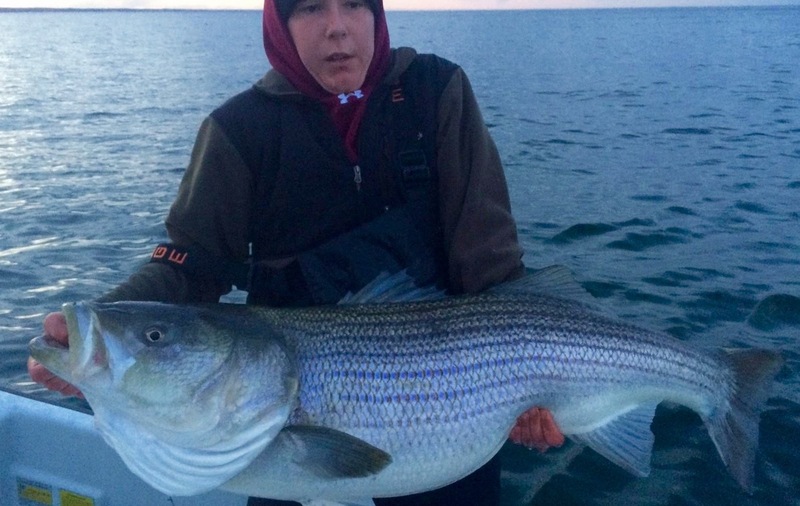 They may be young, but they are at the very top of the light-tackle game. It’s a real pleasure to see them rewarded for their hard work. It’s officially the first day of Spring in the Mid-Atlantic region. I expect fishing to keep getting better. Just today I heard of some big fish caught off the beach at Sandy Point, and a forty-three inch striper caught off the pier at Matapeake. The migration is early, so hopefully most of the big fish will spawn before kill season opens on April 16th. Remember, when it comes to light tackle casting, it’s the little things that make the difference between catching dinks and slamming trophies. Stealth is crucial to making bad days good and good days great. Here’s a video showing some of our fish this winter along with some of the tough conditions in which we’ve been fishing. Tight lines! Very nice. Seeing Ron and Craig and the boys catching like that gives us all hope that we can do it too. It just shows what anyone can do when they are really driven to learn something. I never underestimate you guys. My husband and I was out there last week and you were the only guys catching. I thought we were doing everything right. I just ordered your book. Order received and shipped, Kim. Don’t get discouraged. It’s tough this year with all the boats around.